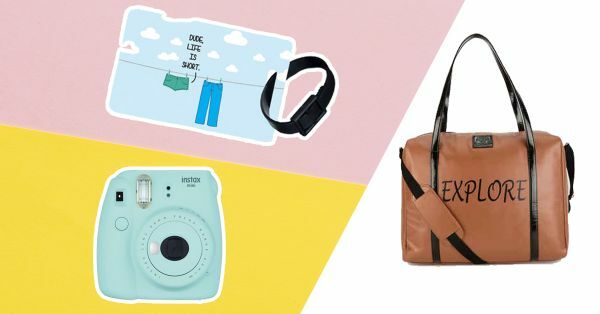 Here's The Ultimate List Of Travel Gifting Ideas For The Newlywed Couple! A statement bag to carry their luggage in! Most newlywed couples buy sturdy suitcases for themselves but they don’t always invest in a fancy-looking leather handbag. Get them this stylish duffle bag that is not only roomy but also has just the perfect slogan for their honeymoon. Perfect! Newlyweds are always short on sleep, revelling in each others’ company! Help them catch up on their sleep then with this cute little eye mask that’ll block away the light and help them slip into sweet slumber whenever they want. A monogram passport case to keep all their documents safe! Get the couple’s initials engraved on a passport case and watch them flaunt it at every trip. Who wouldn’t love this customised gift? Let her buy her own make-up. Why don’t you get her a makeup kit instead? The thing about make-up is that it has to be tried and tested before it’s bought. So, it doesn’t really make for a great gift, you know? Why not gift her a cute bag to stash all her beauties, instead? Little accessories like these luggage tags can up your cool quotient. Gift them newlyweds this luggage tag then and watch them use it aplenty. A reader will find time to read at his honeymoon too. After all, he wouldn’t let the gorgeous landscapes go to waste without delving into a good book or two in them. A Polaroid camera to help them safe-keep all their memories. It’d make for a gift that the couple would love, cherish and use long after their honeymoon is over. It might also just be the best wedding gift, ever! And, a selfie stick to help taking photos easier! For they’ll be taking loads of selfies everyday and would want them all to do justice to the scenic landscapes they’re honeymooning at. Most men aren’t very particular or picky about their grooming essentials and chances are, if you’ll gift them a fancy looking kit as a wedding gift, they’ll just pack it along on their trip. Convenient, right? Portable Juice maker that doubles up as a mobile charger! Battery banks have made it to the modern day essentials and no traveller can think about going on an adventure without one. Gift this portable juice maker to them newlyweds then and they won’t be able to thank you enough for this extremely useful gift. A journal to record this journey of a lifetime. Encourage the newlywed couple to write about their precious moments while they are living it. Months later, this would become their most priceless possession.